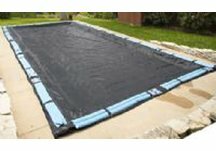 Our rectangle in-ground pool covers are in stock and ready to ship. All of our in-ground covers are made for the most popular rectangle sized pools installed. Offering both a solid heavy grade vinyl and an easy-to-handle rectangle mesh cover, both cover options come in multiple sizes. Keep your pool spotless inside and out all winter long with an in ground pool cover! 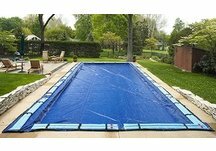 Our in ground pool covers help protect the pool from the elements and many carry a manufacturer warranty.